a winglike process. adj., adj a´lar, a´late. ala na´si the cartilaginous flap on the outer side of each nostril. Ala nasi with major and minor alar cartilages. From Dorland's, 2000. Symbol for alanine or its monoradical or diradical. 2. Pronounced, longitudinal cuticular ridges in nematodes, usually found in larval stages (Ascaris lumbricoides), although occasionally present in adult worms (Enterobius vermicularis). 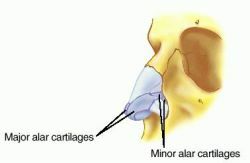 ala na´si wing of nose: the flaring cartilaginous expansion forming the outer side of each of the nares. 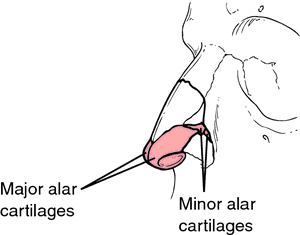 The major and minor alar cartilages of the ala nasi. 2 the axilla. alar, adj. abbreviation for the amino acid alanine. (2) A winglike structure or process. 2. delta–Aminolevulinic acid, see there. Abbreviation for delta (δ)-aminolevulinic acid. Abbreviation for alanine or its monoradical or diradical. 1. [TA] A winglike anatomic structure. a wing-like projection such as occurs on a bone, as an outgrowth of a petiole, or as a lateral outgrowth of flowers of the family Papilionaceae or of fruits or seeds dispersed by the wind. n winglike cutaneous-covered cartilaginous structure on the lateral aspect of the external naris of the nose. pl. alae [L.] a winglike process, e.g. the cervical and caudal alae of nematodes; the wing-like structures at the esophageal and tail regions of the worm. an area on the floor of the 4th ventricle; the trigonum nervus vagi of the medulla oblongata. a lobule of the rostral part of the cerebellar hemispheres that extends from the vermis. the wing of the nose; the cartilaginous flap on the outer side of either nostril. the lateral parts of the base of the sacrum which carry the articular surfaces for the ilium and the transverse processes of the last lumbar vertebra.